LIDAR or 3D laser scanning was developed in the early 1960s for submarine detection from an aircraft, and early models were used successfully in the early 1970’s. Nowadays, the environmental research is hard to imagine without the use of remote-sensing techniques like Light Detection and Ranging (LIDAR) and Radio wave Detection and Ranging (RADAR). High spatial and progressive resolution of the measurements, the possibility of observing the atmosphere at ambient conditions, and the potential of covering the height range from the ground to more than 100 km altitude make up the attractiveness of LIDAR instruments. The variety of interaction processes of the emitted radiation with the atmospheric elements can be used in the LIDAR to allow the determination of the basic environment variables of state, i.e., temperature, pressure, humidity, and wind, as well as the geographical survey, river bed elevation, study of the mines, density of forests and hills, study on underneath of the sea (Bathymetry). Accurate distances are then calculated to the points on the ground and elevations can be determined along with the ground surface buildings, roads, and vegetation can be recorded. These elevations are combined with digital aerial photography to produce a digital elevation model of the earth. The laser instrument fires rapid pulses of laser light at a surface, some at up to 150,000 pulses per second. A sensor on the instrument measures the amount of time takes for each pulse to reflect back. 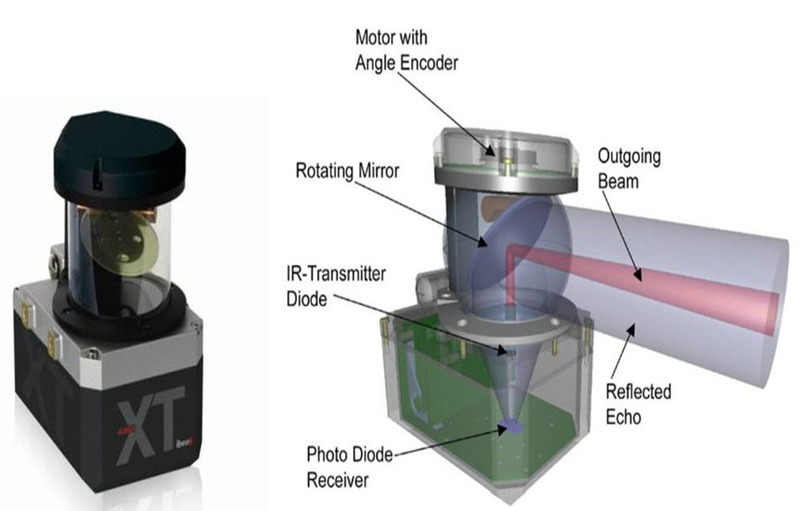 Light moves at a constant and known speed so the LIDAR instrument can calculate the distance between itself and the target with high accuracy. By repeating this in quick progression the instrument builds up a complex ‘map’ of the surface it is measuring. With airborne Light Detection and Ranging, other data must be collected to ensure accuracy. As the sensor is moving height, location and orientation of the instrument must be included to determine the position of the laser pulse at the time of sending and the time of return. This extra information is crucial to the data’s integrity. With ground-based Light Detection and Ranging a single GPS location can be added at each location where the instrument is set up. The Lasers are categorized by their wavelength. 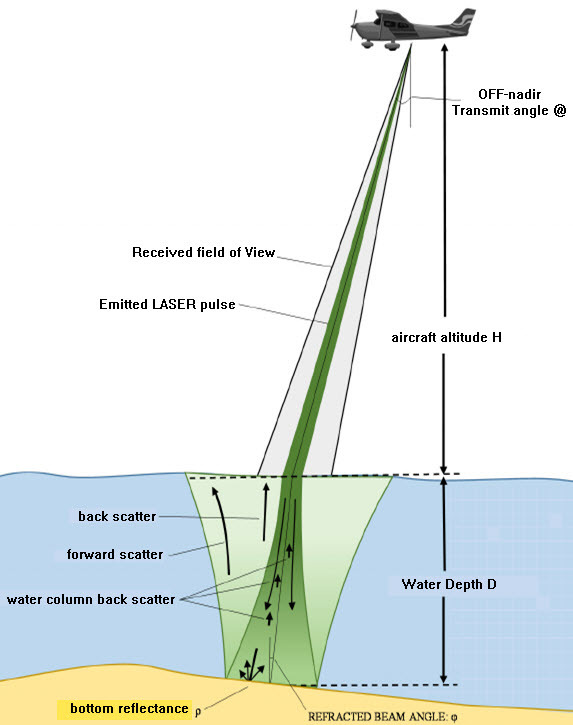 Airborne Light Detection and Ranging systems use 1064nm diode-pumped Nd: YAG lasers whereas Bathymetric systems use 532nm double diode-pumped Nd: YAG lasers which penetrate into the water with less attenuation than the airborne system (1064nm). Better resolution can be attained with shorter pulses provided the receiver detector and electronics have sufficient bandwidth to manage the increased data flow. The speed at which images can be developed is affected by the speed at which it can be scanned into the system. A variety of scanning methods is available for different resolutions such as azimuth and elevation, dual axis scanner, dual oscillating plane mirrors, and polygonal mirrors. The type of optic determines the range and resolution that can be detected by a system. The photodetector is a device that reads and records the backscattered signal to the system. There are two main types of photodetector technologies, solid state detectors, such as silicon avalanche photodiodes and photomultipliers. 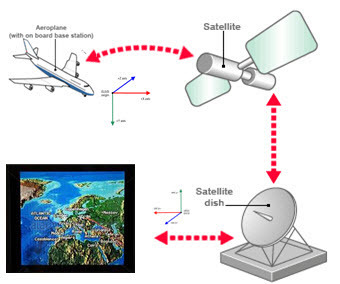 When a Light Detection and Ranging sensor is mounted on an aeroplane satellite or automobiles, it is necessary to determine the absolute position and the orientation of the sensor to maintain useable data. 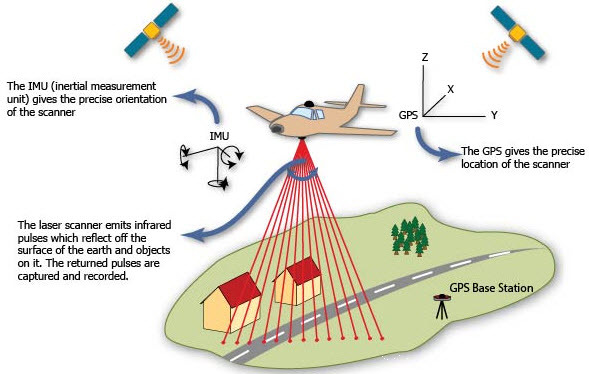 Global Positioning Systems (GPS) provide accurate geographical information regarding the position of the sensor and an Inertial Measurement Unit (IMU) records the accurate orientation of the sensor at that location. These two devices provide the method for translating sensor data into static points for use in a variety of systems. The Light Detection and Ranging mechanism just collect elevation data and along with the data of Inertial Measuring Unit is placed with the aircraft and a GPS unit. With the help of these systems the Light Detection And Ranging sensor collect data points, the location of the data is recorded along with the GPS sensor. Data is required to process the return time for each pulse scattered back to the sensor and calculate the variable distances from the sensor, or changes in land cover surfaces. After the survey, the data are downloaded and processed using specially designed computer software (LIDAR point Cloud Data Processing Software). The final output is accurate, geographically registered longitude (X), latitude (Y), and elevation (Z) for every data point. The LIDAR mapping data are composed of elevation measurements of the surface and are attained through aerial topographic surveys. The file format used to capture and store LIDAR data is a simple text file. 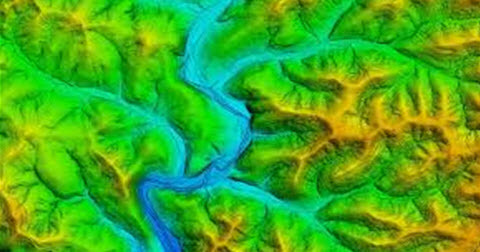 By using elevation points data may be used to create detailed topographic maps. With these data points even they also allow the generation of a digital elevation model of the ground surface. The LIDAR is used for calculation of phytoplankton fluorescence and biomass in the ocean surface. It is also used to measure the depth of the ocean (bathymetry). It has x, y, z coordinates. Elevation values can be used everywhere, in roads, building, bridge and other. It has made easy to capture the surface height, length, and width. LIDAR is used to measure the density of clouds and concentration of oxygen, Co2, nitrogen, sulfur and other gas particles in the middle and upper atmosphere. LIDAR has always been used by the military people to understand the border surrounding land. It creates a high-resolution map for the military purpose. LIDAR has been used for the study of the cloud and its behavior. LIDAR uses its wavelength to strike small particles in the cloud to understand cloud density. Greenlight (532 nm) Lasar of the LIDAR is used to measure underwater information is required to understand the depth, width of the river, flow strength and more. For the river engineering, its cross-section data are extracted from Light Detection And Ranging data (DEM) to create a river model, which will create a flood fringe map. Light Detection And Ranging is very accurate and clear-cut technology, which uses Laser pulse to strike the object. Regular Photogrammetry or other survey technology cannot give the surface elevation value of forest canopy. But the LIDAR can penetrate through the object and detect the surface value. Have you got the basic information of LIDAR and Its Applications? We acknowledge that the above-given information clarifies the basics of Light Detection and Ranging mechanism concept with related images and various real-time applications. Furthermore, any doubts regarding this concept or to implement any electronic projects, please give your suggestions and comments on this article you can write in the comment section below. Here is a question for you, What are the different types of Light Detection and Ranging? I love the article and is a great one for understanding how LiDAR works and its applications, but, I find that it lacks any mention of this system being used in many automated/ self-driving cars from companies like Ford and GM. It would make for a great addition to this article for a further picture on where this system is added and how it works on cars for things like automated driving. Thanks for giving complete information about LiDAR and its applications . Really helpful! Thanks for giving complete information about LiDAR and its applications. Really helpful! Great article about the LIDAR! The subject is well presented and the article is well divided.